Let Fitzgerald & Partners break Brexit barriers and direct your business to realising its full potential. Why set up in Ireland ? How Fitzgerald & Partners can navigate you through Brexit? Fitzgerald & Partners can form a company in Ireland that is a subsidiary of a UK company, register the company and directors for taxes, and assist with getting a bank account opened. The strategic move of incorporating your company in Ireland, which gives you access to the whole European market through Fitzgerald & Partners. We can also provide the co working space in our Business Innovation Hub. Let our expert team take away your worries and strife, so you can focus on what really matters. We can advise on labour mobility, tariffs and cross border VAT. We have worked with lots of uk firms in helping them to plan for brexit. Contact our F & P team today to learn more about the various options available to your business as part of your Brexit strategy. We have many years of experience in company formations, company secretarial and corporate services. We can also assist with other essential services for your business including setting up a Corporate Bank Account, Corporate Tax, and VAT Registrations. Call 353 21 4774500. 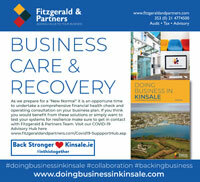 We are working with lots of SMEs at the moment and businesses. Irish business is entering a new era. Our Fitzgerald & Partners team are here to work with you to help prepare for any scenario and to provide support in the months ahead. We are working with both Irish and UK firms in their contingency planning in terms of Brexit which covers a multitude of areas including cash flow and currency, contingency planning and regulation, supply chain, customs and on a practical level, applying for EORI numbers for SMEs trading with non EU Countries to register. Lots of changes are happening including the Brexit Omnibus Bill. This will allow goods to be imported form the UK without having to pay VAT at the time of import, assuming the business operates with full VAT recovery. The same treatment will apply to all imports from outside the EU. This is a major change in the VAT rules which will assist in cash flow arrangement of all importers if enacted. Uncertainty continue to dominate as far as Brexit is concerned and in this context we are working with our clients to prepare Brexit Business Plans looking at prudent business planning and preparation for same.